Your Sleeping Bag. Make your own. Yes you can. Camping at -40C in the snow. How I made the perfect sleeping bag. You can too and sleep with great satisfaction knowing you did. Winter camping is serious stuff. Unlike summer camping, an improper bag for winter camping can be disastrous. Properly prepared and you will sleep like a baby. The most important piece of equipment you must have is a very good comfortable bag. If you have checked out prices lately you will soon realize that you may pay more plenty for a good bag. A top rated down filled bag will easily cost $395. There are all kinds of opinions about what kind of bag is best. For the sake of argument I will tell you about an experience I had with winter camping in Cape Breton Island a few years ago. I had an old, well used down filled war surplus bag that was lightweight. I could not get warm at any temperature. When it got wet it took days to dry out. I decided that if I was going to try all weather camping I would get something that really worked well. While shopping around a supplier who sold make your own gear from kits I spotted a sleeping bag kit that looked like it could do the job. The insulation was Hollofil, a man made fiber that was easy to dry. While I was at it I ordered enough Thinsulate to enable me to add a layer on top and on the bottom of the bag. With all of the materiel on hand, and the pattern before me, I set out to construct the best bag possible. My wife was not to happy as I managed to break every sewing machine needle in the house. A trip to town for more, and many hours later, the best ever bag lay on the kitchen table for all to see. The amazing part of this exercise was that I had never used a sewing machine in my life. I could tell you many stories about my perfect bag but this one will tell it like it was. It was mid winter on Cape Breton. Many feet of snow covered the Cape Breton Highlands in a deep blanket and we were caught in a very deep cold spell. Up on the Highlands the temperature hit -40C. My buddy and I set out for a two day ski. We would ski up to a snowmobile cabin some eight miles away. The cabin was equipped with a wood stove and a gas range and a few bunk beds. We soon warmed to the task of skiing up the mountain trail and found the temperature cold but bearable. We reached the cabin about 4 pm. Just before dark I suggested that we should sleep outside in the snow. Kenny looked at me as if I had gone stark raving mad. I was serious and went outside and not far away pounded down a deep depression in the snow. I then covered the depression with a layer of spruce bows and lined the bottom with the same. After a hearty meal, we headed outside to our dens. Kenny had a good down filled bag. We settled in for the night with the temperature resting right on -40C. After about an hour, Kenny was freezing and headed for the warmth of the cabin. I slept like a baby, warm and comfortable in my home made bag. It worked perfectly. I could hear trees cracking through the night as the temperature continued to drop. Morning came and I tried a trick I learned in the service years before. I got up, put my boots on and clad only in my under-shorts went for a short walk. Five minutes later I returned to don my clothes and found them to be very nice and comfortably warm. The outer surface of your body will cool and this causes your clothes to feel warm. I used my home made sleeping bag for years and it gave me 110% satisfaction ever after. 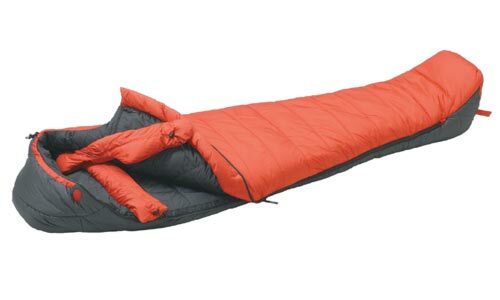 Check out the idea of making your own sleeping bag. You will be surprised at what you might produce.